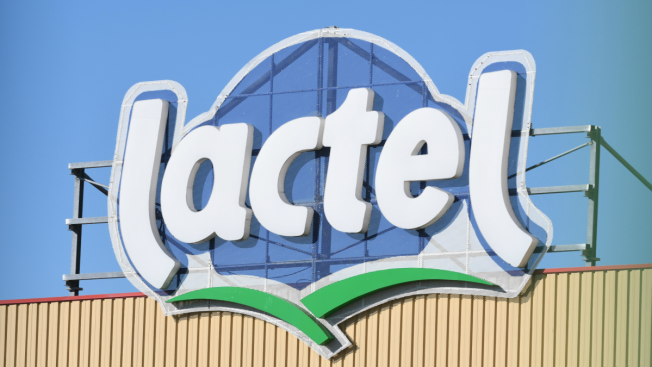 A file photo taken on Aug. 22, 2016, shows the logo of Lactel, a brand of Lactalis, at the headquarters in Change, near Laval, northwestern France. Baby milk maker Lactalis and French authorities have ordered a global recall of millions of products over fears of salmonella bacteria contamination. Company spokesman Michel Nalet told The Associated Press on Monday Dec. 11, 2017, that the "precautionary" recall both in France and abroad affects "several million" products made since mid-February. Baby milk maker Lactalis and French authorities have ordered a global recall of millions of products over fears of salmonella bacteria contamination. The French company, one of the largest dairy groups in the world, said it has been warned by health authorities in France that 26 infants have become sick since Dec. 1. According to a list published on the French health ministry's website, the recall affects customers in countries around the world, including: Britain and Greece in Europe, Morocco and Sudan in Africa, Peru in South America and Pakistan, Bangladesh and China in Asia. Company spokesman Michel Nalet told The Associated Press on Monday that the "precautionary" recall both in France and abroad affects "several million" products made since mid-February. Lactalis said in a statement that the 26 cases of infection were linked to products called Picot SL, Pepti Junior 1, Milumel Bio 1 and Picot Riz. It said it is "sincerely sorry for the concern generated by the situation and expresses its compassion and support to the families whose children fell ill."
The company said a possible source of the outbreak has been identified in a tower used to dry out the milk at a production site in May. Disinfection and cleaning measures have been put in place at the suspected site in western France. The health scare started earlier this month when Lactalis was told that 20 infants under six months of age had been diagnosed with salmonella infection. The company ordered a first recall that has been extended to more products at the request of French authorities following new cases of infections. Lactalis employs 75,000 people in 85 countries, with a turnover of 17 billion euros ($20 billion). The symptoms of salmonella infection include abdominal cramps, diarrhea and fever. Most people recover without treatment.